A day after announcing the firing of Chicago's police superintendent, Mayor Rahm Emanuel said he would not resign over the city’s handling of dash-cam video showing the fatal shooting of 17-year-old Laquan McDonald in October 2014. "Look... We have a process, it’s called the election. 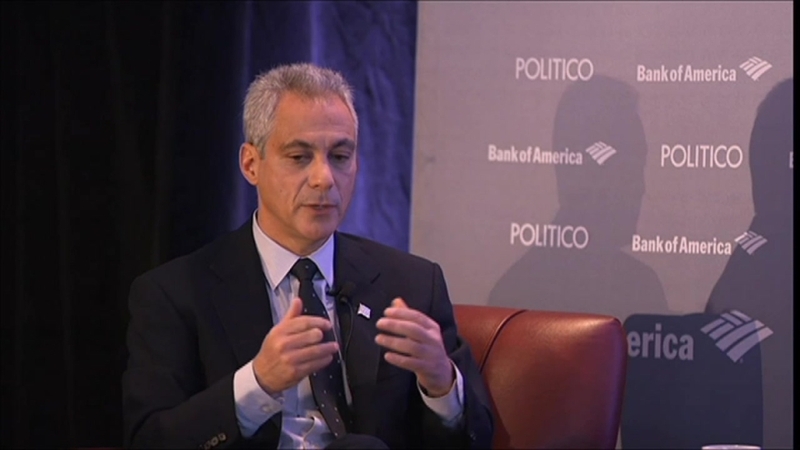 The voters spoke," Emanuel said during a Wednesday morning Politico Playbook roundtable interview. "People can express their views, but as it relates to what I have to do, the people had to vote," he added. "They made a decision and I’m going to execute the responsibilities with being the mayor and be accountable for the decisions I make." Emanuel and former top cop Garry McCarthy have faced mounting criticism over the McDonald case, with many citing the 13 months it took to charge the officer involved. Others question whether Emanuel saw the dash-cam video before its release. Mayor Rahm Emanuel continued to defend himself Wednesday on the city’s handling of the release of the Laquan McDonald video, blaming the policies that have been cemented in place for years. NBC 5's Mary Ann Ahern reports. Community leaders gathered at City Hall Wednesday to call for the mayor's resignation, saying he has turned the city into a "laughing stock and an embarrassment." "Would you consider that?" the Politico moderator asked. "No," Emanuel stated, before taking a sip of his coffee and making a quick joke. Emanuel also addressed rumors that the missing minutes from Burger King surveillance footage was orchestrated by the CPD as an attempted cover-up. "If you’re worried about a cover-up, the last person you want involved looking at that is me," Emanuel combated. The defense comes after a Chicago area district manager for the food chain told NBC 5 that Chicago police officers deleted footage from a security camera at the Burger King located fewer than 100 yards from where McDonald was shot and killed in 2014. Emanuel said he's not involved and pointed to the FBI. The dismissal of Police Superintendent Garry McCarthy closed the door on his four and a half years as Chicago’s top cop but left open questions first raised by NBC 5 Investigates. Chief among the questions: why was there no audio on any of the dash cam video; and what happened to the 86 missing minutes from the surveillance cameras at the Burger King just yards away from where LaQuan McDonald was shot? NBC 5's Carol Marin reports. "The tapes and everything (involved), all that information is with the FBI and the U.S. attorney going back 13 months ago, or a little longer. That’s who has it," he said. "When they conclude everything, the questions regarding that tape will be answered to the thoroughness of the public. And if there is an action that’s required after that to hold people accountable, we will." Emanuel also said that given the city's current circumstances, he will not being traveling to Paris as planned for the highly anticipated global climate summit. "Even though I believe in the issue of climate change as current and pressing .... I’m not going to go to Paris," he said. "I’ll deal with the issue appropriately and consistently here in the city [in a way] that’s consistent with what I feel is a tough issue. But I’m also going to deal with the issue [here] that’s front and center for the city." Emanuel said over the years, he had been asked to fire McCarthy multiple times, but was pleased with the lower crime record McCarthy turned around and progress he had made. In regards to growing demands for an independent investigation into the city, he did not agree with them. "To set up another investigation when one has yet to conclude, in my view, is wrong," Emanuel said. "Not wrong, but until that’s done... hitting the restart button is not going to get us to the comprehensive solution… Given all the work that’s been done, we wouldn’t want to start over." 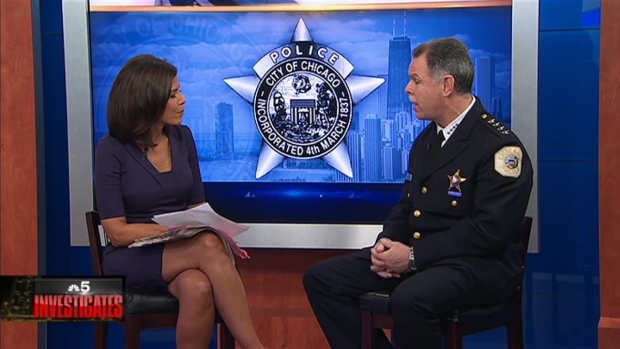 NBC 5’s Zoraida Sambolin sits down for an exclusive interview with Chicago Police Supt. Garry McCarthy in the midst of intense scrutiny to discuss Laquan McDonald’s police shooting.